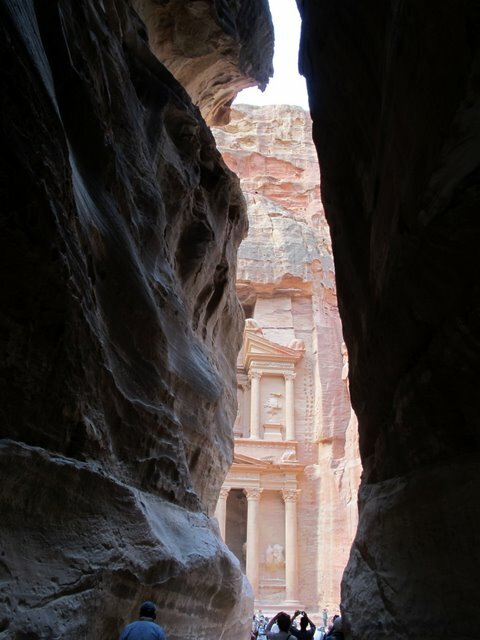 There is no easy way to visit the pink city of Petra, but the beautiful view of the Treasury from the exit of the narrow Siq canyon rewards the traveler for the long hike over Roman paving. 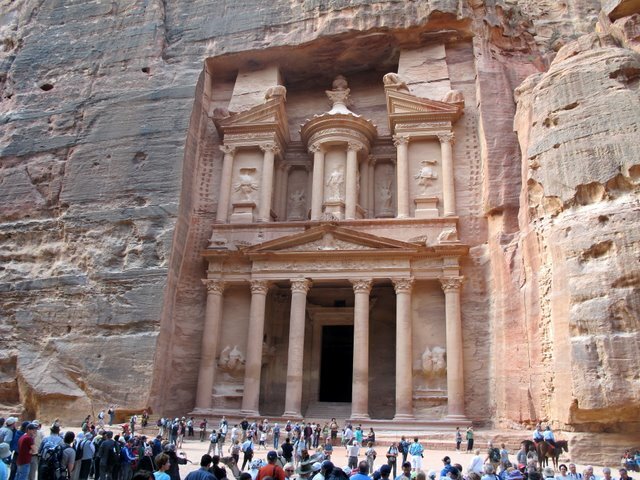 The remaining 2 1/2 mile stroll through Petra to view the Royal Tombs and colonnaded central area is rather pleasant in the early morning relative cool (90’s). However, the prospect of returning the same way, now going uphill, in the not so cool (100’s) dusty afternoon SEEMED not as inviting as an elegant ride out on a noble steed of the desert. 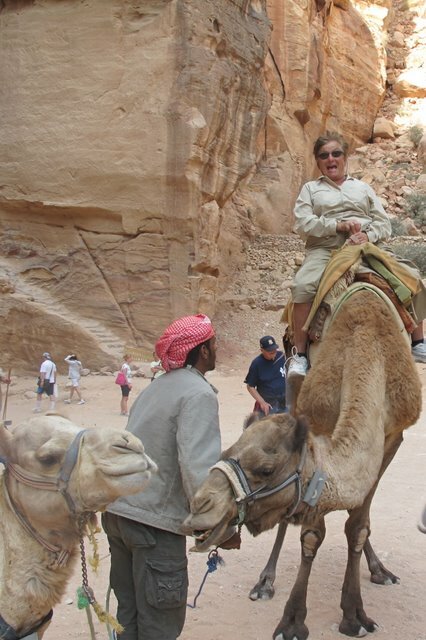 After a rather hazardous mounting—the camel sends you sky high, rear end first, without warning—several camel facts became immediately apparent. 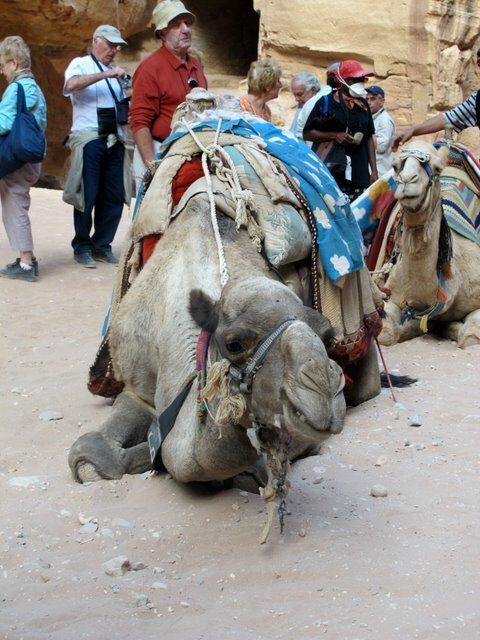 Camels are very wide, tall, and have the graceful gait of a sinking boat in high seas. Also, in order to get as many tourists uploaded, the favorite pace is fast. 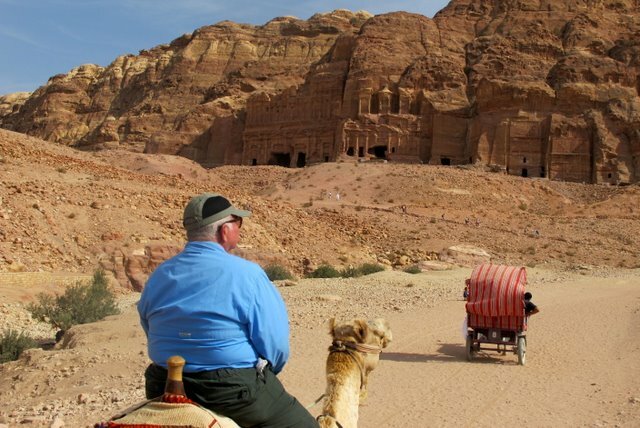 We totally ignored the beautiful facades of the Royal Tombs as we bounced along, gripping the camel’s neck with our ankles in hopes of remaining aboard. At last we were safely (YEA!) back at Treasury, only to discover the worst was yet to come—the descent. To help the poor terrified novice camel rider dismount the noble steed abruptly drops to his front knees, leaving the hapless tourist frantically trying to avoid exiting the beast head first down the camel slide. We suffered no permanent damage, but walking was a bit problematic for a few days. Ah, the wonders of the internet! 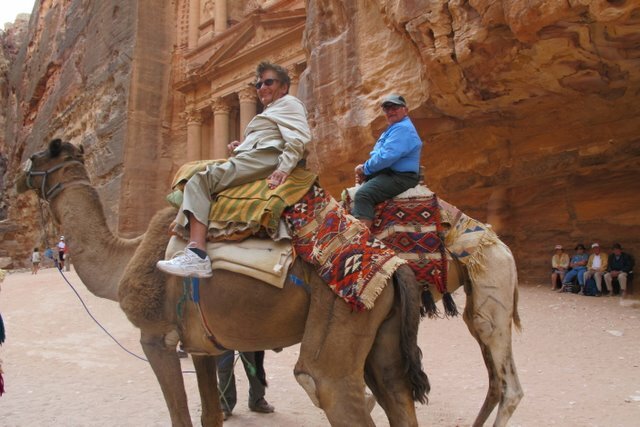 Thanks for the opportunity to experience a camel ride in Petra.